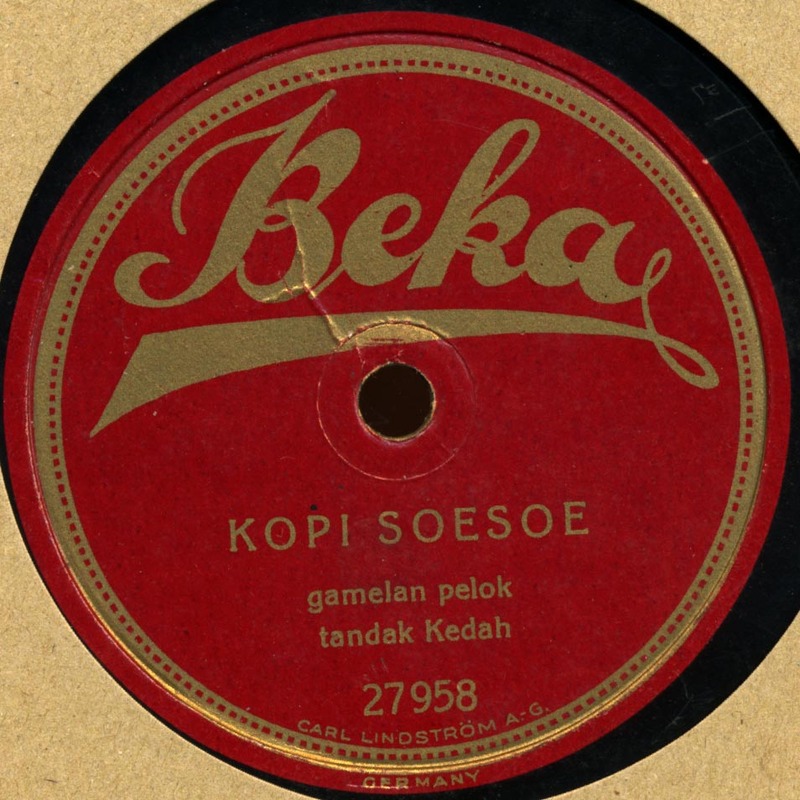 In 1905, Beka made it’s first recordings in Indonesia, then called the Dutch East Indies. After first recording in Constantinople, Cairo, Calcutta and Rangoon, the team of Willy Bielefeld, Heinrich Blumb and William Hadert recorded examples of Javanese gamelan and the popular stamboul songs in the Dutch East Indies. Subsequent trips were made up until the outbreak of WWI. During the years before the war, both Beka and Odeon were acquired by the Carl Lindstroem company, with a few smaller labels as well, consolidating German recording activity under one company. Unfortunately, the war severely disrupted the German recording industry. But by the mid-1920s, things were going well and the Lindstroem lables began to recover. Beka had many hits with Miss Riboet and other stamboul stars, and they continued to record Gamelan music from Java as well. In 1928 they made their legendary trip to Bali, along with Odeon, making the only Balinese Gamelan recordings from the era, although the Balinese records were commercial failures at the time. Like all the Lindstroem labels, Beka was included in the mega-merger of 1931 that created EMI. Max Birkhahn was one of the main recording engineers in Indonesia during this period, and in 1928 he recorded the record presented here. I don’t know much about the music contained herein, but maybe one of our enlightened Haji Maji readers can come to the rescue. The title refers to Indonesian coffee (kopi) made with condensed milk. Another treasure ! Thank you ! Nice to know that “Kopi Susu” is sang earlier that I tought. Previously I’ve heard the version of Miss Mahani maybe sang in late 30s or early 40s. Tandak Kedah,….it looks like from Kedah, Malay peninsula.